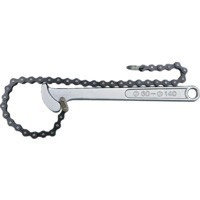 Double polished head and joint with hardened steel jaws. The dual material grip handle manufactured with a polypropylene core for strength and durability with a soft thermoplastic outer for non-slip comfort grip. 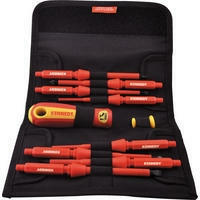 Ideal for environments where repetitive work is undertaken. Joint protector stops the handles closing together, preventing trapped fingers. Ergonomic insulated full size handle, swivel cap and eight interchangeable drivers supplied in a compact protective pouch with belt loop. 2-in-1 design, use the detachable swivel cap for fast (low torque) driving, or use the full size detachable ergonomic handle for higher torque fastening. Safe up to 1000V AC/1500V DC. 10 Piece Set Contents (mm): Parallel: 0.4 x 2.5 x 100mm, 0.5 x 3.0 x 100mm, 0.8 x 4.0 x 100mm, 1.0 x 5.5 x 100mm and 1.2 x 6.5 x 100mm. Cross Point: No.0 x 100mm, No.1 x 100mm and No.2 x 100mm. Industrial quality chrome vanadium steel, chemically blacked. 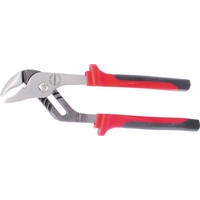 Ideal for terminal loupe forming, wire manipulation and shape forming in confined spaces. 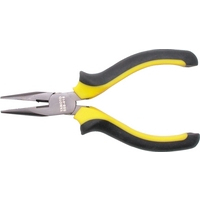 Round jaw finish with smooth action single joints and hardened cutting edges. Laser etched markings. Bi-material grips. Ball and socket universally positional joint, holds the high grade distortion free mirror at any angle. Chrome plated high polish finish telescopic shafts. 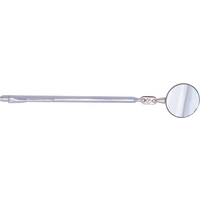 Circular Mirror With high power magnet and pocket clip. Mirror diameter: 30/50mm.